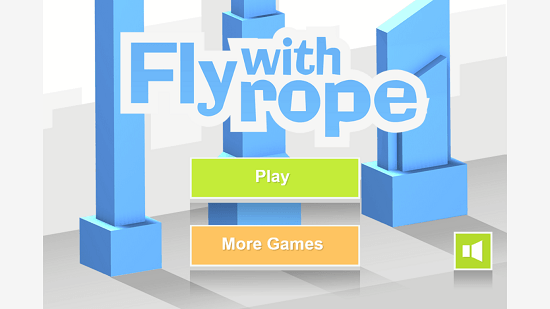 Fly With Rope is a free action game that is developed by Magic Games Inc. for Windows 8 and 8.1 users. It is a different game which has story of a man throwing rope in the air to touch the buildings and swing through the city he is in. Fly With Rope takes you to different places like Egypt, Paris, London, Taipei, Toronto, Dubai, Kuala Lumpur, etc. The game starts with the man being in Egypt. The game has simple color scheme with not many graphics. Despite of this, the buildings in this action game are designed very nicely. The color scheme is really well chosen. 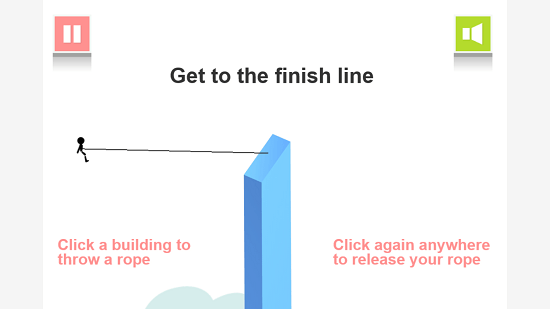 The action game starts with the man falling from the sky, this means that you have to click your mouse so that the character throws black rope to make it stick to the building. After the rope is stuck on the building, the character can easily swing in the air. When the character is towards right side, you can leave the rope and throw another rope to make him be on another building. The important thing the player has to keep in mind is that if the man is near the surface of the ground, he might touch it and then the game ends as the man shatters in pieces on the ground. The game finishes but you can start it again. To reach other cities and places you will have to clear the stages you are in presently. Apart from the buildings, there are elements like air balloons in the air that you can stick the rope to and move forward. The game has the classic style of moving forward towards right side. You can also try out Windows 8 free game apps like cut the rope and Flappy bird 8. You can pause the game at any point of time. You can also switch the sound of the game off if you don’t want it to play.